Is it wrong to cry over the deceased? Please clarify if someone cannot control his tears while remembering his beloved child who has passed away, is there anything wrong with this? I have read that when tears flow, it is a kind of mercy from Allah and it is not haram. “We visited Abu Sayf, the blacksmith, with Rasulullah (sallallahu ‘alayhi wa sallam). He was the father of the wet-nurse of Ibrahim [the son of Nabi -sallallahu ‘alayhi wa sallam-]. 3) Sayyiduna ‘Abdullah ibn ‘Umar (radiyallahu ‘anhuma) reports, “Sa’d ibn ‘Ubadah fell ill. So Rasulullah (sallallahu ‘alayhi wa sallam), came to visit him with ‘Abdur Rahman ibn ‘Awf, Sa’d ibn Abi Waqqas and ‘Abdullah ibn Mas’ud (radiyallahu ‘anhum). When he arrived, he found him surrounded by his family and asked, ‘Has he passed away?’ They said, ‘No, O Rasulullah’. Rasulullah (sallallahu ‘alayhi wa sallam) then began to weep. When the people saw Nabi (sallallahu ‘alayhi wa sallam) weeping, they also wept. The above narrations illustrate the permissibility of crying over a deceased as well as when remembering the deceased. 2) Sayyiduna ‘Umar (radiyallahu ‘anhu) said, Leave [the daughters of Khalid ibn Walid -radiyallahu ‘anhu] to cry over him, as long as they do not throw sand on their heads or shout. What Happens When A Person Dies It is mentioned in the Quran: ‘When death comes to one of you, our messengers (angels of death) take him (his soul) into their custody and they do not neglect in doing so (they perform their job promptly)'. (Al-An-Aam - 61) It is mentioned in the Hadith - Upon the authority of al-Bara' ibn Aazib who said: We went out with the Prophet (صلى الله عليه و آله وسلم) to a burial of a man from the Ansaar (original inhabitants of Madina) until we arrived at the grave and he still had not been placed in the slot of the grave. Then the Messenger of Allah (صلى الله عليه و آله وسلم) sat down and we sat around him. You would have thought that birds were upon our heads from our silence and in the hand of the Messenger of Allah (صلى الله عليه و آله وسلم) was a stick which he was poking the ground with. Then he started looking at the sky and looking at the earth and looking up and down three times. Then he said to us: "Ask Allah (سبحانہ و تعا لی) for refuge from the torment of the grave", he repeated this command two or three times. Then he said O Allah (سبحانہ و تعا لی) I seek refuge in you from the torment of the grave (three times). Then he said: "Verily, the believing servant, when leaving this life and journeying to the hereafter, angels will descend upon him, their faces will be white as if they were suns, they will have with them a shroud (kafan) from the shroud of Paradise), and an embalmment (Hanout) from the embalmment of heaven. Then, they will sit for as far as his eye can see. Then the angel of death (peace be upon him) will come and sit at his head and will say "O you virtuous soul; come out to forgiveness and pleasure from your Lord ". So it will come out as a drop comes out of the mouth of a jug (with ease), then he will take it, not leaving it in his hand for longer that a blink of an eye until they (he and the other angels) have placed it in that shroud and that embalmment (Hanout). And there will emanate from it a smell like that of the most sweet smelling musk on the face of the earth. Then they shall ascend with it and they shall not pass with it by any group of angels but they will say: What is this good and sweet-smelling soul? Then they shall say to them (he is) "such" the son of "such" choosing the best of the names he used to be called in this life. Until they reach the lowest sky, then they shall ask permission to enter, and they shall be granted entry, until they end at the seventh heaven sky, then Allah (سبحانہ و تعا لی), exalted and high, shall say: "write the book of my servant in `Illiyeen (And what will explain to you what `Illiyeen is. A register fully inscribed to which bear witness those nearest to Allah (سبحانہ و تعا لی) (Al-Mutaffifeen - 18), and his book will be written in `Illiyeen, and he shall be said "return him to the earth, for (I promised them) I have created them from it, and into it I shall return them, and from it I shall extract (resurrect) them a second time (Al-Anbiya - 55)". So (he is returned to earth and) his soul is returned to his body (he said and he will hear the footsteps of his friends who buried him when they leave him). Then two angels shall come and sit him up next to them and shall ask him: "Who is your Lord ( Man Rabbuka)?". 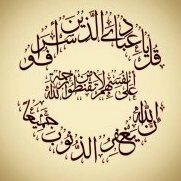 He shall reply "My Lord is Allah(سبحانہ و تعا لی)". Then they shall ask him: "What is your religion (Ma Deenuka)?". He shall answer them: "My religion is Islam". Then they shall ask him (by showing the Prophet’s -صلى الله عليه و آله وسلم - form) "What was your belief about this person?". He will reply "He is the Messenger of Allah- صلى الله عليه و آله وسلم". Then a caller will call from the sky: "My slave has spoken the truth, so spread out for him from the heaven, and clothe him from the heaven, and open a door for him from the heaven (within his grave)", so it's goodness and its smell will come unto him, then his grave will be expanded for him as far as he can see. Then a man will come to him. His face will be handsome, and his clothes will be handsome, and his smell will be sweet. Then he shall say unto him: I bring you glad tidings of that which will make you happy [Rejoice with the pleasure of Allah(سبحانہ و تعا لی) and delights that endure]. This is the day that you were promised (Al-Ahqaf - 16). Then he will say [and may Allah (سبحانہ و تعا لی) give you glad tiding] "who are you?, for your face is the face of someone who comes with good news". He shall reply: "I am your good deeds, [by Allah(سبحانہ و تعا لی), I did not know of you but that you were quick to the obedience of Allah(سبحانہ و تعا لی) and slow to His disobedience, so may Allah (سبحانہ و تعا لی) reward you good]". Then he shall say: "My Lord bring the Hour [Qiyaamah] so that I might return to my family and my wealth" [it will be said to him "be at rest"]. The above Hadith is narrated by Ahmad Ibn Hambal, Abu Dawud, Ibn Majah, at-Tayalisi, and al-Hakim who said it is according to the standards of Bukhari and Muslim. This text is the text of Ahmad, text between brackets is from the other narrators and other narrations of Ahmad. One day out of the many days of life. A man was traveling with his Wife and Kids. On the way, he met someone standing in the roadway. The man asked his wife and kids : Should we ask him to ride with us? They said together: Yes, of course, because money can help us if we want to do something, and get anything we wish for. So, they took Money to ride with them. And the vehicle continued on its way until the man met someone else on the road. The Father asked: Who are you? So, the father asked his wife and kids : Should we ask him to ride with us? They all answered in one voice: Yes, of course, because with high position and power we will have the ability to do anything we want and own anything we desire. The man took high Position and Power along and the vehicle went ahead. Further ahead they came across many more people who offered to add joy and comfort to their trip, and with the advice of the family, the man kept allowing them to accompany him. Yet again the vehicle was stopped by someone who wanted to give them company. He said: I am Deen. The man, his wife, and the kids said in one voice: No, this isn't the time; we are looking for pleasures on this trip, and Deen will prevent us from joy; it will have control over us, and we will suffer listening to it and being loyal to it. So the man said:Deen, please wait and rest assured we will definitely return soon to you, and pick you up. Sadly Deen was left behind and the vehicle continued its trip. They found someone asking the father to get out of the vehicle.. He said to the father: As far as you are concerned the trip has ended!!! ! Get out of the vehicle and come with me. Deen alone can come with you. Is he there with you? The father answered: No, but I have left him not too far behind. If you can let me go back, I can get Deen in no time. The man said to him: They will not benefit you; nor will they protect you. So, the father asked: And who are you exactly? the one you were quite heedless of and didn't take into account on your trip!! The father looked back at his vehicle; he found his wife taking control of it and continuing the trip with all of its passengers but him.